As part of our nationwide Volunteers’ Week running from 1 to 7 June, today’s blog focuses on the 10th anniversary of the RSPB Torbay & South Devon Team. The Team was formed in 2008 so is coming up for its 10th anniversary this year. We’re a little different to most local groups in that rather than being a band of existing RSPB members, we’re a small team who encourage the wider public to take a greater interest in the wildlife around them. We also promote the RSPB, raise funds and recruit where possible. Looking back, setting up this new team - which was to be the first of its kind in the country - was quite an exciting prospect! As luck would have it I was vaguely acquainted with a lady called Carole who lived close by in our hamlet near Dartmoor. I knew she was a horse rider and seeing her hobbling along the lane one day I asked if she’d fallen off her horse. Well, you would, wouldn’t you? The conversation continued and finally resulted in Carole becoming the first recruit to team. She also took on the role of treasurer’s job. We were off to a flying start! Over the next few months we assembled a friendly, helpful team of seven or eight which was enough to get us started. Stalls at local fetes and fairs where we enjoy good conversations with people to raise wildlife awareness, money and the profile of the RSPB. Guided wildlife walks, some open to all and some for relative beginners only. Talks with other clubs or societies which raise funds for the RSPB, spread the word about the importance of wildlife conservation and entertain at the same time. Visits to local schools with demonstrations which educate and encourage participation in nature conservation. Rewarding work involving the next generation! 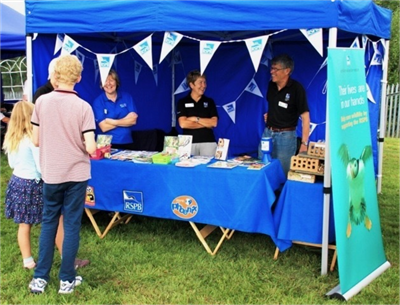 While our team provides events for existing RSPB members, much of the focus is on communicating the conservation message to the wider public in an engaging and fun way, and of course, we also raise funds to support the work of the RSPB. We’ve had numerous members over the past 10 years and we keep in touch with many of them, inviting them to various “celebration do’s” - a sure mark of the lasting friendships formed from membership of the Torbay & South Devon Team. We are presently looking for one or two more volunteers to enable us to attend more events. If you love wildlife, are happy talking to people, are active enough to help carry and erect a gazebo and live in the area around Torbay/Newton Abbot why not contact us for further information using our website www.rspb.org.uk/groups/torbayandsouthdevon. To find a local group near you, click here.